When I signed on as assistant camp manager, I was excited to find out that I would be in charge of running Cycle Oregon’s Bike Camp. Since 2011, I have been involved with the camp at Cycle Oregon first as a volunteer, then as an instructor, and now as a manager. 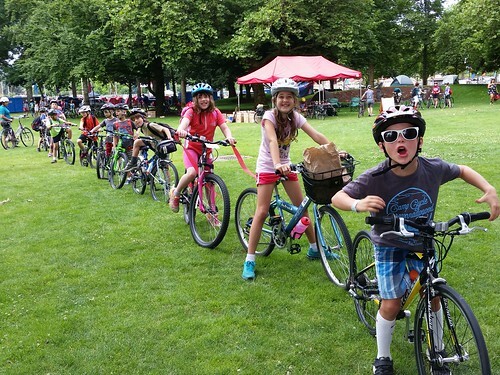 The Bike Camp at Cycle Oregon is a condensed version of what we do at the Community Cycling Center, with kids coming from all over Oregon, Washington, and as far north as Victoria BC. While their parents do their long ride during the day, the kids ride with our instructors and 14 of their peers to explore a rural town in Oregon. For the younger riders, this is their first group ride experience and the furthest they’ve ridden without their parents. This year, Cycle Oregon went to Monmouth Oregon. 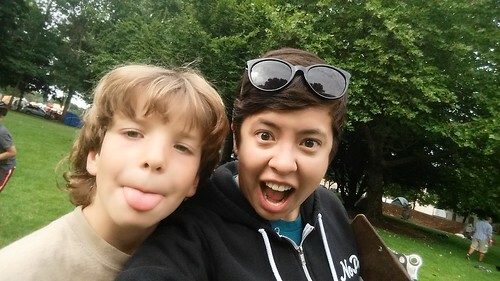 My weekend began on Friday afternoon with check-ins with campers and their families. Up until this moment, I was anxious that I forgot an important detail that would show up when I least expected it to, but as camp staff and volunteers showed up ready and excited for the weekend, I felt re-assured that we could take on anything that came our way. Once check-in started, a steady stream of riders and their families greeted me. The excitement level varied among families. Some campers were clearly excited to be there. Others weren’t so sure but their parents were excited enough for them. I met several riders that I’ve had in my group from previous years and was ecstatic that they remembered me. One rider in particular had been in my group during my first year at Cycle Oregon. He had since moved on to a bigger bike and had grown into a confident rider at eight years old. Although we spend about seven hours with the group each day, the change we see in in them from the start of camp is apparent. On both Saturday and Sunday, kids returned to camp with confidence and a sense of accomplishment. They may not have ridden as many miles as their older siblings who did the long Cycle Oregon ride, but they acquired valuable skills such as riding in a single file line, hand signaling, and communicating with the group while riding–many skills we take for granted as adult riders. In addition, unlike the mapped route for the Cycle Oregon riders, the kids have a say in where they want to go. Within reason, they can pick out specific parks they want to ride to and decide what they want to do when they get there. 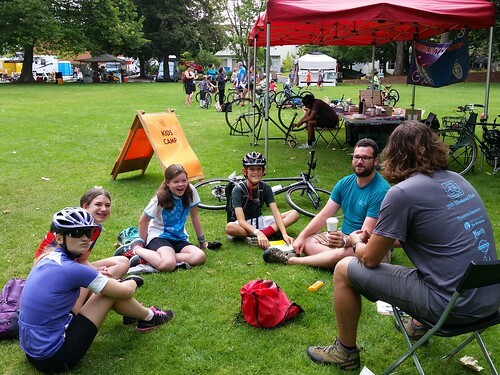 Thanks to a supportive team–our Bike Camp instructors, BTA’s Bicycle Safety Educators, our volunteers Mychal, Bridgett, and even little Arthur–this years camp at Cycle Oregon turned out to be a success. Each day, the kids were excited to tell their parents about all the riding they did during the day. New parks were explored and new friendships were made. One camper slept so soundly after a long day on the bike that her mom had to make sure she was still breathing. And best of all, an ice cream pop was waiting for every rider crossing the finish line.